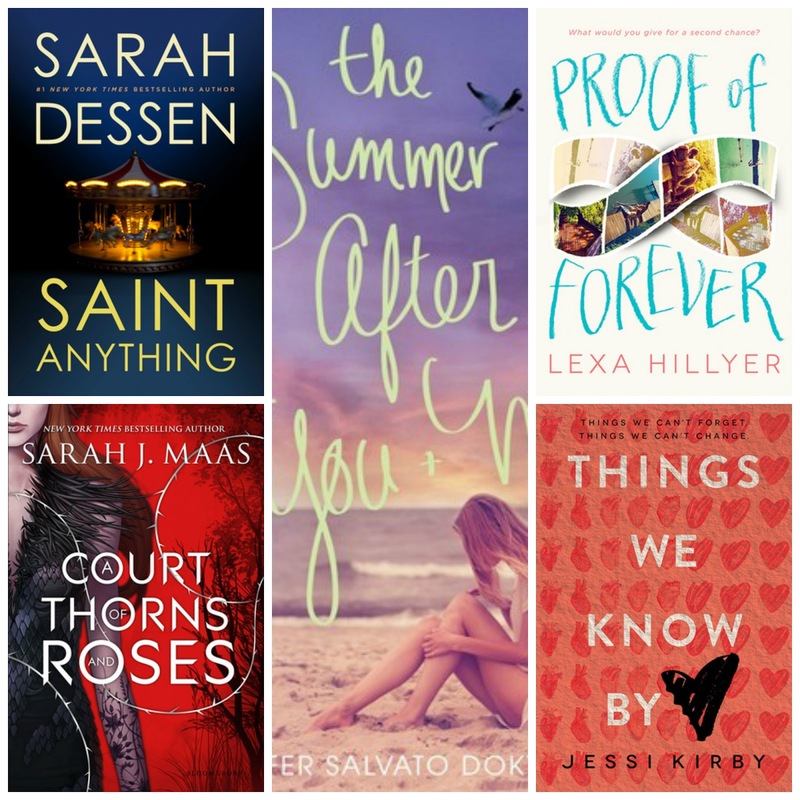 This week's Top Ten Tuesday deals with Books I'm Most Looking Forward to Reading in 2015. After I composed this list, I realized that summertime books are pretty much my favorite types of reads, but we already knew that! 1. Saint Anything by Sarah Dessen - It's Sarah Dessen. Need I say more? 2. Proof of Forever by Lexa Hillyer - A summertime story + time travel? YES! 3. The Summer After You and Me by Jennifer Salvato Doktorski - The Jersey Shore and Superstorm Sandy…this one sounds like it will have a special place in my heart. 4. A Court of Thorns and Roses by Sarah J. Maas- I love the sound of this one: Beauty and the Beast meets faerie lore. 5. Things We Know By Heart by Jessi Kirby - I have read most of Kirby's books and love them. This one sounds like a tear-jerker! 6. The Start of Me and You by Emery Lord - I really enjoyed Open Road Summer, so I am excited to check this one out! 7. Heat of the Moment by Lauren Barnholdt - It had me at summer trilogy, friendship and self-discovery. 8. 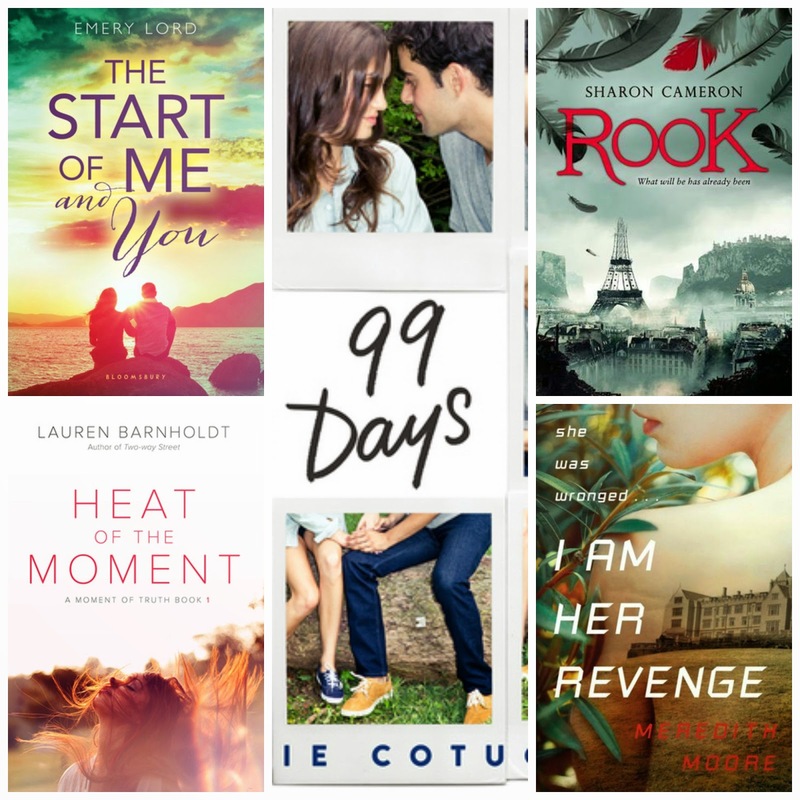 99 Days by Katie Cotugno - I heard this book is an emotional read, but I think it will be worth it! Plus, I love the summer before college…definitely an important time in a person's life. 9. Rook by Sharon Cameron - Intrigue, romance and suspense? Yes to all of this. 10. I Am Her Revenge by Meredith Moore - A thriller which takes place at an English boarding school sounds like my kind of read. What do you think of my list? Let me know which books you are most looking forward to reading in 2015. This meme is hosted by The Broke and the Bookish. Me too! 2015 is gearing up to be an exciting year! Thanks for visiting, Christy! Oh! I'm also excited about The Start of Me and You!!! Me too. I really loved Open Road Summer, so I hope it doesn't disappoint. Thanks for visiting! Great picks! You've got quite a few on your list that I am excited for myself - A Court of Thorns and Roses and The Start of Me and You. And some that I forgot to mention - 99 Days and Things We Know By Heart are two I am very excited for, can't believe I forgot those. 2015 is going to be a great year for books, I can't wait. I hope you enjoy them all when you finally get to read them :) Here's my STS. I agree, Charnell! I am so excited with all of the awesome YA books coming out next year. Thanks for visiting! YES CHRISTINA!!!! SO many amazing books on this list that I can't wait to get my hands on either. The Court of Thorn and Roses and The Start of You and Me are at the very top though. Followed closely by Rook. So excited for all of them though! I'm glad we agree!! 2015 is looking like an awesome year for YA. I hope these books don't disappoint. And would you believe I have never read Sarah Maas? I need to find time to read her other series this winter! Awesome list! They're all so pretty! I actually have most of those, but the ones I wa t the most, I don't have. I want to read every book on your list! Narrowing it down to just ten books was tough! I hear you! I had a hard time narrowing it down to ten as well….so many great ones coming out! Thanks for visiting, Michelle! I can't wait for Sarah Dessen's new novel, even though The Moon and More just didn't work out for me I still love her books. I've yet to read anything by Sarah J. Maas but I heard many-many great things about her so now I'm really looking forward to reading something by her. Proof of Forever sounds amazing I love books about friendship! I haven't heard about 99 Days before but I checked it out and it sounds AWESOME! Can't wait! I'm reading all these wonderful lists and now I'm so freaking excited for all these books! I have never read anything by Sarah Maas before either. I thought I was the only one Veronika. I have heard really good things, so I am excited to check her books out. Thanks for visiting and I'm glad you agree with me regarding my picks for 2015! Awesome picks! I absolutely love time travel, so Proof of Forever sounds so amazing. I'm surprised that this is the first I've heard of it! I'll definitely have to pick it up when it's released. I also really enjoy Sarah Dessen books-they're always so light and fluffy and fun! My favorite by her is Just Listen. I just read Just Listen this past summer and really enjoyed it! You can't go wrong with Sarah Dessen in the summertime. Thanks for visiting, Krystianna! Things We Know By Heart sounds really good. So far I've liked any book I've read by her. Me too…love Jessi Kirby! I know…you know I am such a sucker for a summertime read. Thanks for dropping by, Christina! Yes! I pretty much want to read ALL OF THESE and most of all I want to read the new Jenny Han! I can't wait to see the cover for that one!